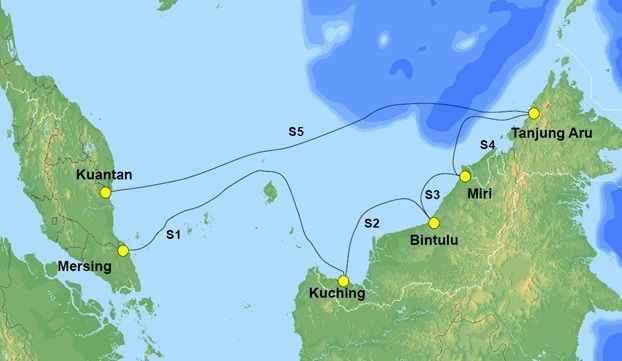 Tokyo, September 20, 2017 - NEC Corporation (NEC; TSE: 6701) today announced the completion of the Sistem Kabel Rakyat 1Malaysia (SKR1M) 100 gigabit per second (Gbps) submarine cable linking Peninsular Malaysia with Sabah and Sarawak. Datuk Seri Panglima Dr Mohd Salleh Tun Said Keruak, Minister of Communications and Multimedia Malaysia said, "This new submarine cable system is part of the Government's initiatives via MCMC to increase the capacity of high-speed broadband and data traffic between Peninsular Malaysia and Sabah and Sarawak. This is among the measures which the Government is undertaking to improve the socio-economic status of people in Sabah and Sarawak through ICT adoption and broadband connectivity and was mentioned by our honorable Prime Minister during the tabling of the 2014 budget. Thus, I am delighted that today, this goal has become a reality." Atsuo Kawamura, Executive Vice President of NEC Corporation said, "NEC has been active in the submarine cable system business for more than 40 years, and in 1980, NEC supplied Malaysia with its first domestic coaxial submarine cable system. NEC has laid a total of more than 250,000 kilometers of cable—the equivalent of six trips around the earth's equator, and we are now recognized as one of the world's top submarine cable vendors. On this occasion, I would like to extend my congratulations to MCMC and TM, and my heart-felt thanks for yet again selecting NEC as your partner to build SKR1M. I sincerely hope that our partnership will be further enhanced, and be given the next opportunity to contribute to the various regions of Malaysia."